Basil Gooden currently serves as the Secretary of Agriculture and Forestry for the Commonwealth of Virginia. His family has been involved in the beef industry for over 30 years. They raise Angus cattle on the farm that Basil's parents bought from his grandparents in the 1950's. The farm began small and has grown over the years. Their father, who was a school principle in the county for 35 years, grew the farm so that he would have something to do with his children once he retired. It was clear that farming was his passion. When Basil's parents passed away, Basil and his six siblings fulfilled their father's legacy and began running the farm with a work team to keep the family operation running and moving towards a brighter future. They each take part in the decision making process for the farm, and four live within driving distance and visit the farm on a regular basis. 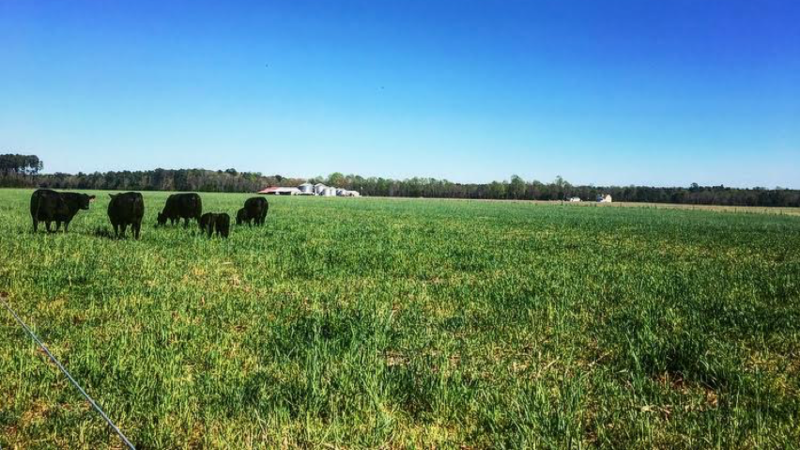 VBIC: Why is beef production what you do, and what do you find most exciting about it? Basil: It is exciting because we are feeding the world. We feel that we are doing our part for sustainability for the world as well as providing nutrition for our communities and society at large. Being able to make an economic impact in our community is also important to our operation. VBIC: What does sustainability mean to you, and what does it look like for your farm? Basil: Sustainability, to me, means that you are taking care of the resources that make your operation what it is. Looking out for the pastures, the cattle, the forest, and water accesses of the cattle. It is important for us to protect our natural resources. We make sure that we are looking towards the future and how we are organized. We are discussing with the children of our family about their interest and involvement of he operation. We are also reaching out to the young people in the community because its vitally important that we cultivate the next generation for the agricultural industry. VBIC: It sounds like you have a lot of great groundwork built for success. What does success look like for your operation? Basil: Success for us is ensuring that we are good caretakers of the land. It is important to us that we are making an economic impact. Having a small family operation as we do, we are not in this for the money. We do this because we love working with these animals. We are proud of what we were entrusted with. Success is making sure that we are doing the best we can at keeping this operation running and moving towards the future and how we are making an impact in our community. VBIC: Community ties certainly run deep in agriculture. What would you say has been one of the greatest opportunities while being involved in the beef industry? Basil: Meeting so many others who are passionate about agriculture. Being part of organizations that have allowed me to be in contact with other producers. Meeting others has allowed us to expand our operation and learn along the way. We are currently a cow/calf operation but in the near future, we are hoping to change our business up by looking at a new business model of marketing meat to our local community. This will allow us to adapt to the needs and wants of the consumers. VBIC: What would you say has been the biggest challenge? Basil: For us, a big challenge has been getting a younger generation involved. We have a farm crew that consists of our generation, or folks older that us. We would love to see our farm have the interest of the younger generation and convey a message that beef production is a viable and honorable profession. Another challenge we have faced with being a family operation, is that succession planning can be difficult. There are so many views and perspectives that need to be taken into consideration. VBIC: I bet that is especially true with six siblings! Let's talk about your cattle...what do they eat? Basil: We grow most of our own forages. It is vitally important as a beef producer to focus on having quality pasture and hay for the cattle. In the past, we were growing our own grains and having them bagged at the local feed mill; today we finish our cattle on grain that we purchase from our local Southern States store. We monitor our herd on a daily basis, and ensure that we are feeding quality feeds. Providing the cattle the minerals and vitamins that they need is also an important aspect of producing high-quality beef. VBIC: What would you say is unique about your farm? Basil: We have a camera system set up where we can monitor our cattle from a distance because none of the siblings live on the farm. We can visualize and make management decisions on the videos of the cattle that are available on our phones. Having this technology allows us to be able to rely on our farm crew or neighbors when something comes up and it will take us a few hours to get to the farm. It is very important to each of us to stay connected to the farm. This technology allows us to stay in contact with day to day operations until we can make our regular visits. 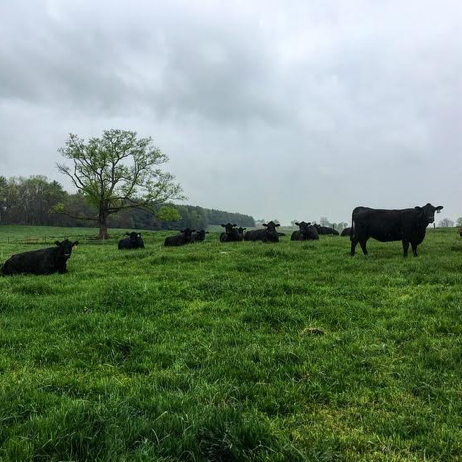 Jimmie and his son, Todd, raise 22 cow/calf pairs near Gloucester, Virginia while maintaining their crop and hay production business. Learn from herdsman Matthew Deacon, who manages over 300 mama cows and 3,000 acres in Berryville, Virginia!